So, I’m pretty proud of myself. By noon yesterday, I had done everything on my list that I wanted to do. So, by the time Devon brought lunch home around 1pm (his district closed two hours early), I was completely done and able to relax. I did everything, except actually make the soup I said I was going to for dinner. After the heavy lunch, I wasn’t feeling a heavy dinner. Plus, we both decided to randomly nap around 4:30pm and by the time I woke up, I really didn’t feel like making it. I am, however, going to go make it now before I head to school for a couple hours (even though I don’t have to be there today — long story, will explain later), so that it can sit and thicken and get better by the time dinner rolls around tonight. Instead last night I made what I’ve been making myself for lunch the past week, which is just a sandwich but an amazing one. When I made the Spinach Pasta Salad a couple weeks ago, I bought two of the huge mozzarella balls, despite the fact that I only needed one because mozzarella is nom, so I had to do something with it before it wasn’t good to eat anymore. 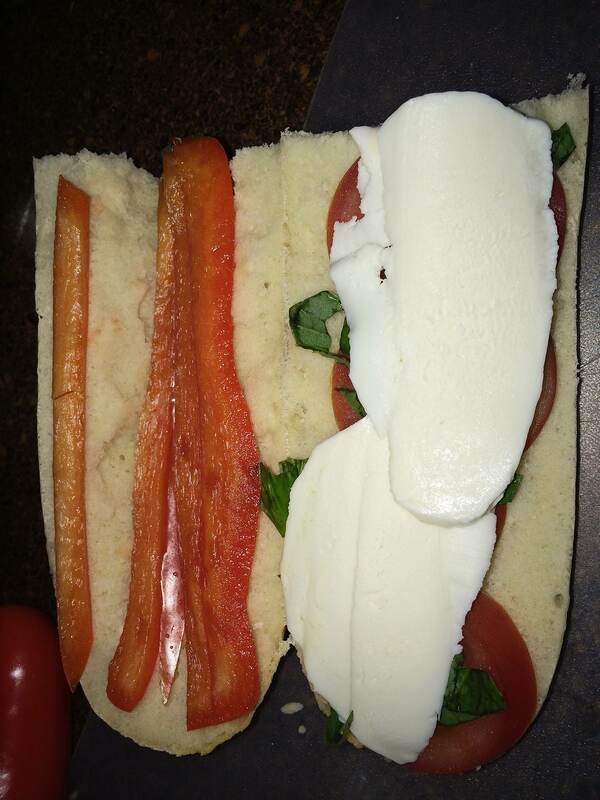 So I made a sort-of Caprese style sandwich for lunch last week and it was delicious. And simple because simple is good. And, I mean, it just looks pretty. Doesn’t it? I just took one of those small french baguette rolls, halved it and took some of the center dough part out so that it wouldn’t be awkward to eat. Then I thinly sliced a roma tomato, made thin strips of a sweet red pepper and chopped up a basil leaf and put a couple slices of the mozzarella cheese on top. I nommed so fast. And I’m….odd? I’m hoping I’m not the only one, but I’m really into using salad dressing as sandwich dressings or sandwich spreads. Mayo is just so plain and tasteless to me. I don’t use it unless I’m mixing it into something. 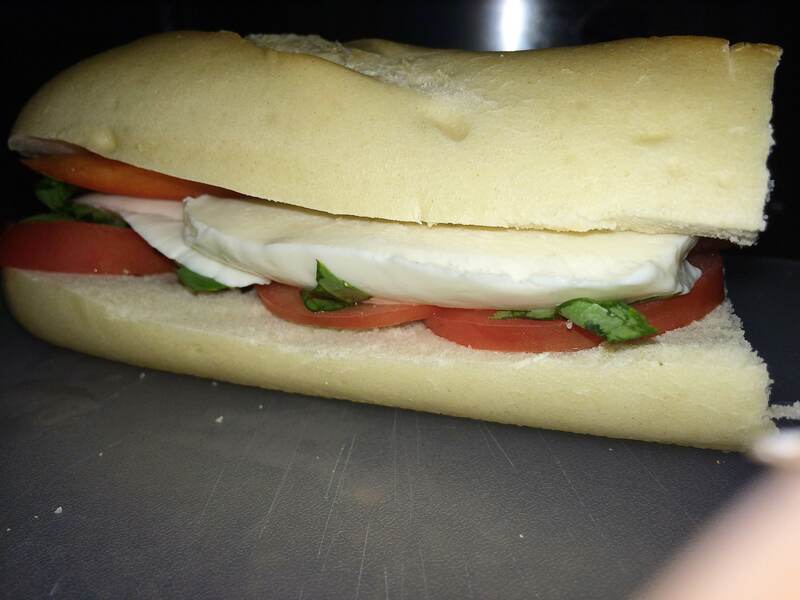 So for this I drizzed some Italian dressing over the basil because it meshed well with the sort of Italian theme of the sandwich and it balanced well with all the sweet veggies on there. I’m pretty sure I’m gonna go buy another mozzarella ball because this was too good. I need to keep eating it. This is making me want lunch now and it’s only 10:30. :sigh: Life is hard.